Angelina Jolie caused quite a stir when she announced she had both her breasts removed shortly after learning that she had an 86% chance of developing cancer in them at some point in her life. Jolie’s predisposition to breast and ovarian cancer (caused by the BRCA1 gene) also brought up the timely issue of who can and can’t afford the highest quality of health care in our country. People know the system doesn’t work, but no one – politician or otherwise – seems to know how to fix it. And that was the general consensus of “the internet.” She’s rich. We’re not. Why bother? 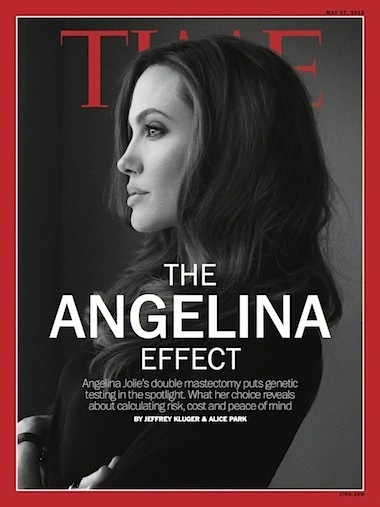 Angelina’s face is on the cover of Time because she put genetic testing “in the spotlight.” And it’s true. My friend and I were just two of the thousands that must have talked about what we would do in her place. I thought we all agreed that the wrong thing was telling a woman what to do with her body?